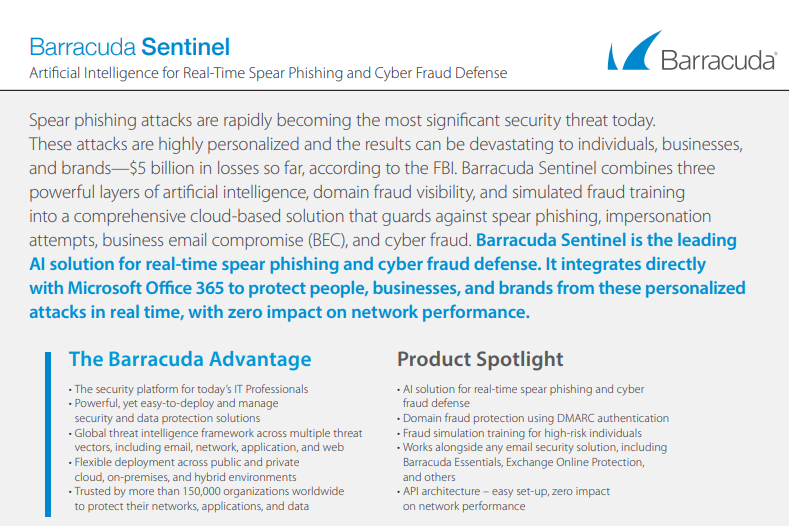 Barracuda Sentinel combines 3 powerful layers of artificial intelligence, domain fraud visibility and simulated fraud training into a comprehensive, highly effective, cloud-based solution that guards against spear phishing, impersonation attempts, business email compromise (BEC) and cyber fraud. 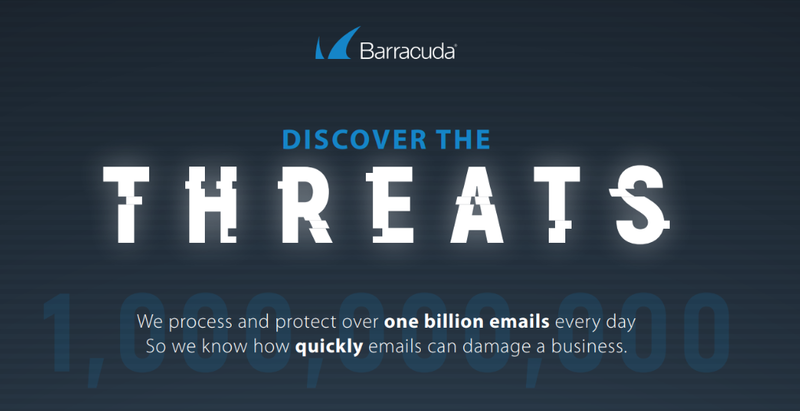 Barracuda Sentinel is the leading AI solution for real-time spear phishing and cyber fraud defence. It integrates directly with Microsoft Office 365 to protect people, businesses, and brands from these personalised attacks in real time, with zero impact on network performance. Your Office 365 Email is Vulnerable to Thousands of Cyber Threats. And the biggest threats may already be in your inbox! Run a FREE Email Threat Scan today. Discover how exposed you are to new threats and reveal the fraudulent emails already in your mail system. 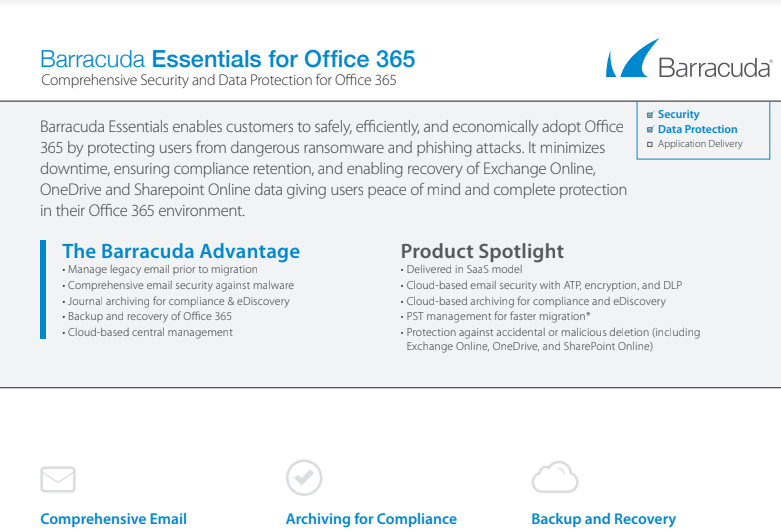 Barracuda Essentials provides the most complete, simple, and affordable solution for protecting business emails and data in Office 365, Microsoft Exchange, OneDrive and G Suite. It combines our award-winning email security, as well as a tamper-proof email archive to ensure compliance and simplify litigation searches. For Office 365, Barracuda also offers full cloud-to-cloud backup and recovery of all your emails and files. Inbound filtering protects against spam, viruses, and phishing attacks. Outbound filtering prevents data leakage and automatically encrypts sensitive data. Advanced Threat Protection blocks advanced zero-hour attacks. Cloud archiving ensures compliance with retention policies, and cloud backup protects you from accidental or malicious data deletion. blocking, encryption, archiving and backup.